As much as I love the idea of putting up peaches and making jam, it’s not something I do. I didn’t grow up with a mother or grandmother who canned, and I have yet to acquire those skills on my own. Equal doses of ignorance and paranoia have me convinced that canning is one sure way to kill my family. Because it’s so foreign to me, it’s also rather romantic. A picture of a pantry lined with jars of tomatoes only kindles my desire to move to the country and spend my days gardening and cooking. A steady diet of [%bookLink code=0064400026 "Little House on the Prairie"] books as a young girl — and, more recently, as a parent — should have reinforced the idea that life on the farm is hard work, but instead I remember Almanzo’s family larder, Pa’s fiddle, and the wide-open prairie. I realized recently that my non-canning days are nearing an end, as each story I hear or read about putting up food fills me with desire and envy. Other people may lust over three-car garages, but the good life for me conjures a cellar full of home-canned green beans, pickles, jams, and tomatoes. And embarking on this new skill set seems more imminent than ever, as my freezer is nearing full capacity and my children’s appetites are ever-growing. When I say freezer, I’m not referring to the stand-alone that is also housing a side of beef. No, I’m talking about that wee little box that sits atop my refrigerator where I stow containers of soup and sauce, stash bagels and buttermilk, and put away as much of summer’s bounty as I’m able. I bought my food mill years ago at a natural-foods store for less than $20. It’s stainless steel, has three perforated disks (small, medium, and large holes, for fine to coarse purées), and is a bit bulky to store. 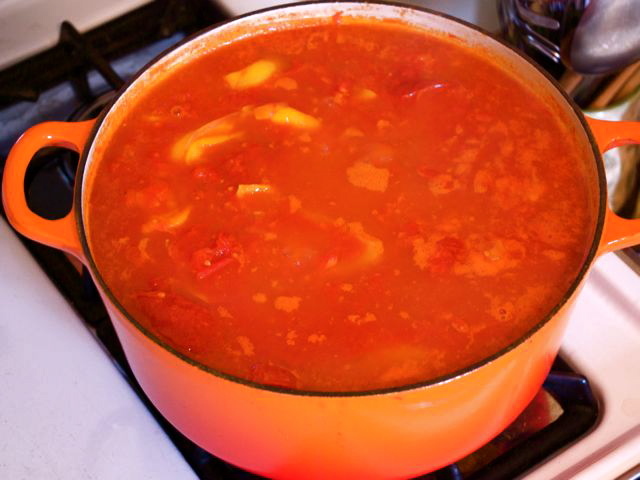 But its merits in making tomato and apple sauce — and the fact that it can be taken apart and run through the dishwasher — far outweigh the inconvenience. [%image foodmill width=126 caption="A food mill is the tool for making a smooth purée."] When shopping for a food mill, you can pay a little or a lot, depending on the brand, the material the mill is fashioned from, and the extras that come with it. Don’t get drawn into the fancy models, unless you think you’re going to dedicate your life to milling; the basics are all you need. The basics in my mind are at least two disks with different-size holes; something that attaches the mill over the bowl or pot into which you are puréeing (my mill has three clamp-like legs), thus making it stable; and detachable parts, which makes clean-up easier. 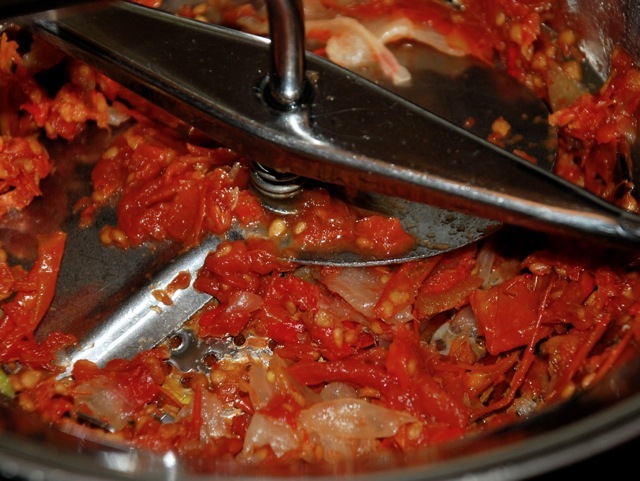 In the case of tomato sauce, this is how a food mill works: After spooning in the tomatoes and roasted vegetables, you rotate the crank with one hand. 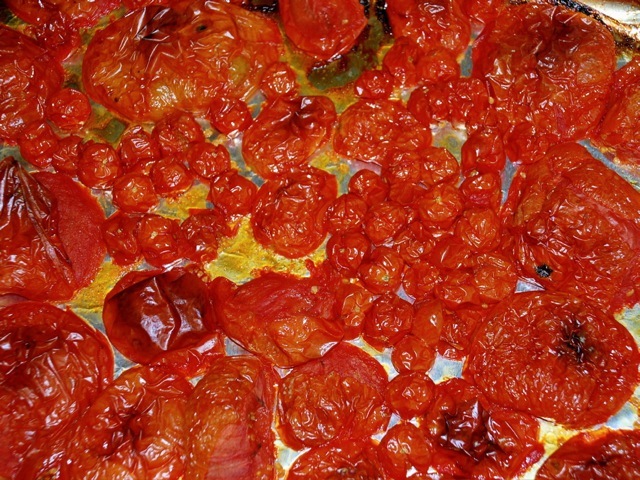 The blade of the mill moves through the tomatoes, pressing the solids under the blade through the perforated disk, while the seeds and skins remain in the food mill. What you end up with is a lovely purée of tomatoes and vegetables, including the pulp and fiber but without seeds or skins. To read more information on various models, as well as a bit of food-mill worship, check out this overview on the blog Apartment Therapy. The layers of my freezer are geological. June lines the bottom with bags of strawberries, topped with July’s layers of blueberries and cherries and August's blackberries. Come September I shoehorn in bags of roasted chile peppers, pesto, and tomato sauce. Most of these I store in large Ziploc bags, which I make as flat as possible (some of the berries are puréed to make them even leaner) and stack in layers. Though my freezer is bursting at the screws right now, I feel a little sad knowing that those bags of berries will only get me through the winter. Come spring, I’ll be sinking my teeth into cold-storage apples and counting the days until I can buy that first pint of local strawberries. But let’s not get too far ahead. 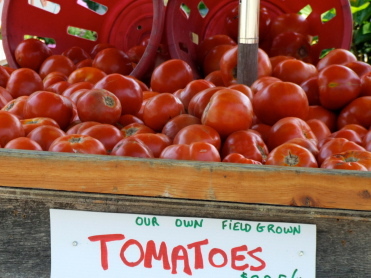 After all, it’s still tomato season and the time for making sauce is now. A few years back I started making big batches of tomato sauce to freeze, gathering all the tomatoes off the vines, cooking them down, and running them through a food mill. This was such a success I’ve continued the tradition, tinkering with both the ingredients and method. Now I supplement what I grow — Lemon Boys, Sweet 100s, Romas, and a couple of heirloom varieties — with a box from a farmstand or farmers’ market. And because I often end up with more tomatoes than I have pots for, I roast some in the oven, too. Since the oven is on, I also roast garlic, onions, and red peppers. Once the tomatoes on the stove have cooked down and the other vegetables are soft, I mix everything together, then pass it through a food mill to remove the skins and seeds. I season the sauce with salt, stir in a bunch of chopped basil, then divvy the booty between freezer bags. It’s a beautiful sauce, kind of an orangey-red, tasting mostly of sweet, ripe tomatoes and basil, with undertones of roasted garlic, onions, and peppers. It’s good as is, tossed with pasta, for a quick meal. I also pair it with sausages and polenta. Sometimes I use it as “tomato sauce” in other recipes, working it into vegetable soup, ratatouille, or beef stew. I’m always grateful for the ease — a flat bag of sauce defrosts quickly in a pan of hot water — not to mention that taste-of-summer pick-me-up. [%image "promo-image" width=300 float=right caption="Sauce, simmering on the stove."] At the risk of deviating, let me sing for a moment the praise of the food mill, which is key in making this sauce. Though I’m willing to spend the better part of a morning prepping, cooking, and bagging tomato sauce, if I also had to peel and seed the tomatoes (not to mention the garlic), I’d opt out. This is the beauty of a food mill — it removes the baddies from the sauce, leaving you with the good flavor that comes from cooking the entire fruit/vegetable. It’s equally essential in making Roasted Applesauce. The weather in Oregon turned chilly recently, so I put saucemaking at the top of the list this week. A trip to a farmstand yielded a large box of ugly, 40-cents-a-pound tomatoes, ready for transformation. After picking all the ripe tomatoes from my small backyard garden, I cleared the kitchen counters, put on some music, and settled into prepping the tomatoes for sauce. Three hours later, the sauce was cooling as I sat down for lunch: roasted garlic spread onto bread and topped with roasted peppers, tomatoes, and onions, fresh basil leaves, and a layer of Jack cheese, run under the broiler until the bread was toasted and the cheese bubbly. In a few months' time, I'll relish those exact same flavors, when the furnace is chugging away and the fresh tomatoes long gone. p(bio). Carrie Floyd is Culinate's food editor.